China Cinda has spotted a clever arbitrage. The Chinese “bad bank”, which is revving up for a Hong Kong initial public offering (IPO), has recently been doing brisk business by borrowing cheaply from other banks and using those funds to buy up companies’ short-term loans to each other. In doing so, it has found a way to square China’s dreaded “debt triangles”. Cinda was originally set up to take on bad loans racked up by China Construction Bank. In recent years, however, it has made an increasing amount of its money by restructuring inter-company debt. It’s the only one of China’s four bad banks which is allowed to buy debt from non-financial companies. These kinds of assets have grown from nothing three years ago to the majority of its distressed debt holdings at the end of June. Here’s how it works: First, Cinda borrows from a bank, typically for around 5-6 percent, according to people familiar with the situation. It then finds a company with a customer which can’t pay its trade bills – say, a cement maker that is owed cash by a real estate developer. Cinda buys that receivable for a small discount to its face value. 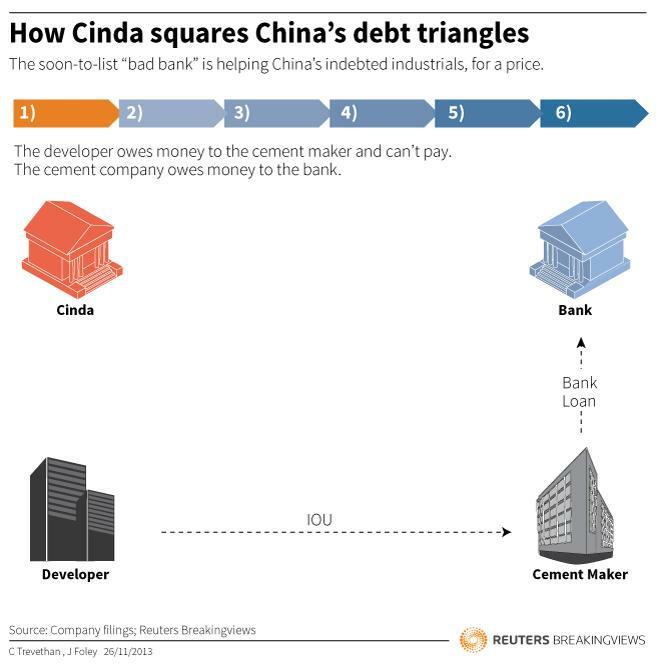 The developer puts up collateral or secures a third-party guarantee, and its debt to the cement maker becomes a loan from Cinda. Everyone seems to gain. The cement maker gets its cash back and the developer buys itself some time – though at a price. Cinda’s loans carry an average interest rate of around 14 percent, according to the company’s IPO prospectus. After deducting expenses and bad-debt provisions equivalent to around 2 percent of the loan, Cinda emerges with roughly a 6 percent spread – more than twice what Chinese banks earn on traditional lending. Because Cinda’s own balance sheet is leveraged, it earns an attractive return on equity of around 30 percent. Companies aren’t the only ones taking advantage of Cinda’s strategy. Some “trust” vehicles, which gather and reinvest funds from the wealthy, have brought in the bad bank to help them pay back investors when developers which have borrowed from the trusts get into trouble. That exposes Cinda to the risk it gets stuck with collateral such as land and buildings, but having its own real estate division at least means it can put those to use. The mystery is why China’s banks don’t get into this lucrative game themselves. One reason may be that many of the afflicted companies are real estate developers, and regular lenders are under orders to limit their exposure to the industry. Another is that banks would rather lend to Cinda, since they can class such loans as “interbank” exposures. These incur a lower capital charge than corporate credits, and aren’t included in banks’ loan-to-deposit ratios, which are capped by regulators. Moreover, structuring these loans is time-consuming, and requires expertise that China’s commercial lenders don’t readily have. Even Cinda currently goes mainly for large receivables – its restructured assets are on average around 100-200 million yuan ($16-$33 million) each. From an economic perspective, the Cinda model is basically helpful, since it eases one of China’s most worrying trends – companies racking up debt to each other in the form of unpaid bills. Accounts receivable among Chinese companies have grown substantially faster than GDP since 2010, according to data from the National Bureau of Statistics. If the cement maker gets its cash back from the property developer, it is more likely to pay its own suppliers and lenders, and the risk of contagion is reduced. Can this profitable trade continue? It can so long as China’s financial system remains essentially closed. First, banks have to keep supplying Cinda with cheap loans. That, in turn, means they must be able to draw on their own cheap funds – most notably consumers deposits. As China’s market develops, and new funds offer savers alluring alternatives, that sure source of low-cost funding will fade. But for the foreseeable future, depositors will keep unwittingly funding troubled companies’ bailouts, and Cinda’s earnings. China Cinda Asset Management on Nov. 25 published its initial prospectus for a Hong Kong stock market listing that could raise up to $2.5 billion in new money. Cinda was founded in 1999 to handle bad debts from China Construction Bank, one of the country’s biggest state owned lenders. The company has recently diversified into buying accounts receivable from companies, and restructuring them into loans. It had 50 billion yuan ($8.2 billion) of such assets at the end of June 2013, compared with just 30 billion at the end of 2012. In the first half of 2013 the average yield on “debt assets classified as receivables”, which also includes some restructured assets acquired from banks, was 13.8 percent. Cinda’s funding is predominantly borrowing from banks. Of its 104 billion yuan of debt at the end of June, 78.9 billion yuan was due for repayment within two years. Total borrowings have increased fourfold from the end of 2011. The average rate of borrowing used for funding receivables was 5-6 percent, according to people familiar with the situation. Underwriters for Cinda’s initial public offering include Morgan Stanley, Goldman Sachs, Credit Suisse and Bank of America.